Zhuo-Hua Pan, Edward T. and Ellen K. Dryer Endowed Professor; Professor of Dept. of Ophth., Vis. 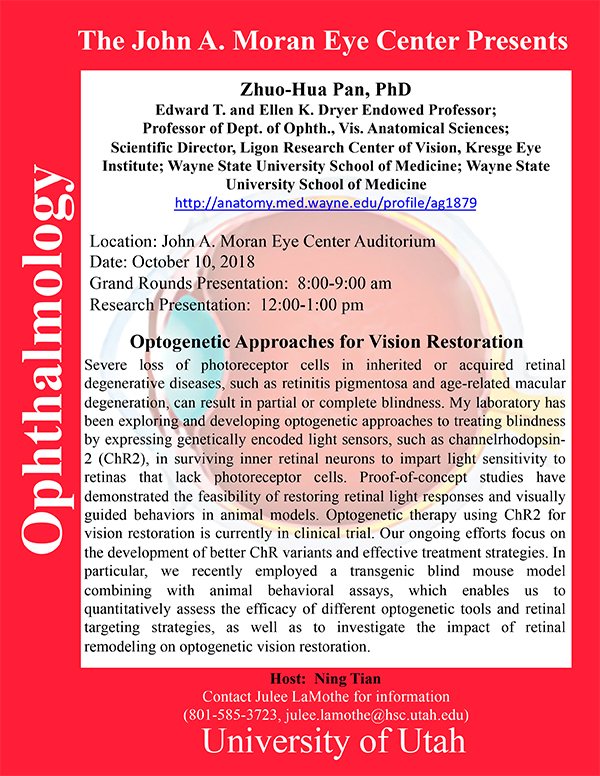 Anatomical Sciences; Scientific Director, Ligon Research Center of Vision, Kresge Eye Institute; Wayne State University School of Medicine; Wayne State University School of Medicine will be delivering a seminar on “Optogenetic Approaches for Vision Restoration” on Wednesday October 10th at 12:00pm in the Moran Eye Center auditorium. He will also deliver a Grand Rounds Presentation at 8:00am, also in the the Moran Eye Center auditorium. Abstract: Severe loss of photoreceptor cells in inherited or acquired retinal degenerative diseases, such as retinitis pigmentosa and age-related macular degeneration, can result in partial or complete blindness. My laboratory has been exploring and developing optogenetic approaches to treating blindness by expressing genetically encoded light sensors, such as channelrhodopsin- 2 (ChR2), in surviving inner retinal neurons to impart light sensitivity to retinas that lack photoreceptor cells. Proof-of-concept studies have demonstrated the feasibility of restoring retinal light responses and visually guided behaviors in animal models. Optogenetic therapy using ChR2 for vision restoration is currently in clinical trial. Our ongoing efforts focus on the development of better ChR variants and effective treatment strategies. In particular, we recently employed a transgenic blind mouse model combining with animal behavioral assays, which enables us to quantitatively assess the efficacy of different optogenetic tools and retinal targeting strategies, as well as to investigate the impact of retinal remodeling on optogenetic vision restoration.